The continent of Africa is the second largest landmass on the earth and is home to hundreds of tribes, ethnic and social groups. 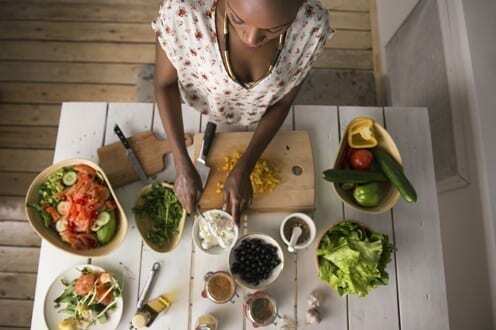 This diversity is also reflected in African cuisine, in the use of basic ingredients as well as in the style of preparation and cooking techniques. A typical African diet may vary enormously depending on where on the continent one means, just as Asian cuisine changes greatly from region to region. However, some aspects of African food are common across the continent. Traditionally, African cuisine uses locally available fruits, grains, vegetables, meats and milk for its dishes. In much of tropical Africa, cow’s milk cannot be produced locally and is therefore rare. The cuisine of Africa can be split into different regions; Central, North, South, East and West. Each region has its own distinctive foods and cooking styles. Traditional green vegetables have an important role in African cuisine as a primary source of nutrition. They provide a variety of minerals and vitamins for the African diet and can give variety to a dish that may otherwise been seen as bland. African green vegetables also provide a source of protein, which is critical. The green vegetables are grown and harvested by many local farmers who will then sell their produce at local markets. The vast region of Central Africa has remained largely free of culinary influences from the outside world, until the late 19th century, with the exception of the widespread adaptation of cassava, peanut, and Chile pepper plants which arrived during the early 1500s. These ingredients have had a large influence on the local cuisine. The basic ingredients are plantains and cassava. Fufu-like starchy foods (usually composed of fermented cassava roots) are served with grilled meats and sauces. A variety of local ingredients are also used to bring flavour and diversity to dishes. For example: spinach stew, cooked with tomato, peppers, chillies, onions, and peanut butter. Groundnut (peanut) stew is prepared, containing chicken, okra, ginger, and other spices. Another favourite is Bambara, it is a porridge of rice, peanut butter and sugar. The most traditional meats are those that are hunted in the forests. Beef and chicken are among the most common meat found in dishes, but game meat preparations containing crocodile, monkey, antelope and warthog, are also served occasionally. North Africa is positioned along the Mediterranean Sea. Over many years traders, travellers, invaders, migrants and immigrants have all influenced North African cuisine. The Phoenicians of the 1st century brought sausages; the Carthaginians introduced wheat and its by-product, semolina. The Carthaginians adapted this into couscous, one of the main staple diets. Olives and olive oils were introduced before the arrival of the Romans. From the 7th century onwards, the Arabs introduced a variety of spices, like saffron, nutmeg, cinnamon, ginger and cloves, which contributed and influenced the culinary culture of North Africa. The Ottoman Turks brought with them sweet pastries and other bakery products, and from the New World, North Africa has received potatoes, tomatoes, zucchini and chillies. Most of the North African countries have several similar dishes, sometimes almost the same dish with a different name (the Moroccan tangia and the Tunisian coucha are both essentially the same dish: a meat stew prepared in an urn and cooked overnight in a public oven), sometimes with a slight change in ingredients and cooking style. In contrast sometimes two completely different dishes will be given the same name. There are noticeable differences between the cooking styles of different nations. There is the sophisticated, full-bodied flavours of Moroccan diet, the fiery dishes of Tunisian cuisine, and the humbler, simpler cuisines of Egypt and Algeria. The cuisine of Southern Africa and its neighbouring countries can sometimes be found referred to as ‘rainbow cuisine’. This is due to the many African, Asian and European influences which make the food a diverse blend of colours and flavours. The Malay influence has brought spicy curries, chutneys, pickled fish, pork or lamb kebabs and a variety of fish stews. The Indians have introduced a different line of culinary practices, including a variety of sweets and savouries. The Afrikaners have their stews of maize with tomato and onion sauce, with or without rice. There are many European contributions like Dutch fried crueller or koeksister and milk tart. French Huguenots brought wines as well as their traditional recipes. The basic ingredients of Southern African cuisine include seafood, meats (including wild game), poultry, grains, fresh fruits and vegetables. Fruits include apples, grapes, mangoes, bananas, papayas, avocado, oranges, peaches and apricots. Meat products include lamb, and game like venison, ostrich, and impala. The seafood includes a wide variety such as crayfish, prawns, tuna, mussels, oysters, calamari, mackerel, and lobster. The cuisine of Eastern Africa varies from place to place. In some parts of Eastern Africa where cattle are seen as a currency, the meat of the animal is therefore not eaten, however, traditionally the milk and the blood of the animal will be consumed. Ingredients such as maize and vegetables are a staple part of the diet and these are grown in abundance by local farmers. Great Asian and European influence has led to the introduction of ingredients such as; curries, lentils, pickles, fruits such as oranges, lemons and lime, and spices such as chillies, peppers, tomatoes, pineapples and bananas which are all now common in Eastern African Cuisine. Also, the introduction of the pig has been a great influence and a high source of meat. A typical West African meal will be high in starchy foods, have a low level of meat and be high in fat. Another common characteristic of Western African cuisine is the use of spices such as chillies and peppers, also spices including cloves, cinnamon and mint, which were relatively unknown until the influence of Arabs through trading. In essence, the local cuisine and recipes of West Africa continue to remain deeply rooted in the local customs and traditions, with ingredients like rice, peanuts, black-eyed beans, brown beans, and root vegetables such as yams, cocoyams, sweet potatoes, and cassava. Cooking is done in multiple ways: roasting, baking, boiling, Frying, mashing, and spicing. A range of sweets and savouries are also prepared. Ingredients such as plantains, peppers and green peas, citrus fruits, and pineapples, which are legacy of slave ship traffic between Africa and the New World, are also not uncommon.